Relatively few young singers get the chance to perform internationally – especially while they are still in college. Thanks to the burgeoning reputation of the Dodge City Community College vocal music department, two DC3 performers got that chance. The DC3 vocal music department was invited to perform at the Dublin Music Festival at Christ Church in September of 2017 by representatives from Music Celebrations International – an organization that matches highly recommended performing ensembles with prestigious national and international music festivals and events. MCI requires that invited groups have a proven record of performance excellence and be recommended by national vocal or musical organizations. “They had seen some of the things we have been doing at Dodge City Community College and they were very impressed,” DC3 assistant professor of vocal music Kerry Kuplic said. The entire department was invited to perform, but due to the cost only two students – Kathryn Ludlam and Stephanie Almaraz – were able to afford the trip. The singers had the opportunity to perform in a stately and historic venue with exemplary singers from all over the United States. 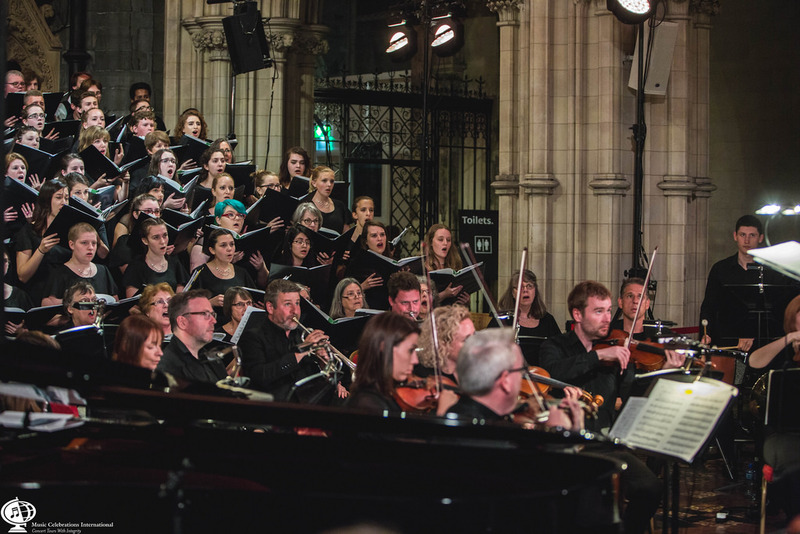 The final performance took place at Christ Church Cathedral – Ireland’s oldest medieval cathedral dating to around 1030 AD – with more than 100 performers from across the country. Befitting the setting and tradition of Christ Church Cathedral, most pieces were sacred, religious selections. Kuplic said the performance was as grand as the ancient architecture itself. “The organizers chose some very challenging pieces, so I didn’t know what to expect. With such a short rehearsal time I wondered how it would work out, but the music was so beautifully performed… it was really moving,” Kuplic said. The trip was an opportunity for DC3 singers to gain valuable exposure and the experience of working with notable music mavens and witness the rigorous work and professionalism required for an elite performance. The ensemble got the chance to perform two choral compositions with legendary jazz composer Dave Brubeck’s son Darius – himself internationally renowned as a jazz musician and Fulbright Senior Specialist. “That was really a great opportunity for the audience and the performers to work with someone so famous,” Kuplic said. The choir that was assembled in Dublin consisted of primarily college groups, but there were also well-established community and youth choirs represented. The singers were accompanied by a professional Irish orchestra, and the entire production was directed by William Skoog, choral director of Rhodes College. Ludlam credited Kuplic’s tutelage to enable her to handle some of the more challenging aspects of the music selections. She’s grateful for the experience the performance gave her as well. While the group was afforded some free time to explore the area, the focus of the trip was the performance experience, and organizers wasted no time preparing the performers. Rehearsals generally ran six to seven hours a day for the five-day trip. Prior to the actual performance, the group from Dodge City was able to tour the Guinness Brewery and Dublin’s other ancient cathedral, St. Patrick’s – which dates back to 1191. They also experienced Dublin’s cultural center in the Temple Bar area, and the eleventh-century Malahide Castle. This was the second international trip for Kuplic and the choral department. He took students to Italy in 2015 and plans another trip in 2020. Kuplic feels strongly that for students of the arts, international travel is an important educational tool, as well as an enriching life experience. “We are geographically isolated here in western Kansas,” Kuplic said. “Some of our students have never flown or even traveled much. To go someplace so different and be able to learn and be exposed to broader environments is so valuable. “This brings a lot of positive publicity to the college and the department. It really sets us apart from other colleges. Ludlam valued the exposure to so many different backgrounds and personalities. “At first, I did feel like I was this person from backwater nowhere,” she laughed, “but then we all just threw off the nametag of where we were from and became one big voice… one big singing family.